Rangers manager Mark Warburton acknowledges a gap exists between his team and Celtic's but aims to close it. A test of how big that gap is comes on Sunday in the shape of a Scottish Cup semi-final against a side presently leading the league above. 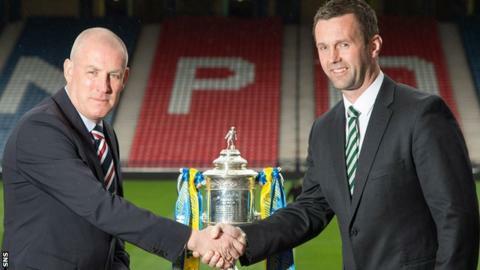 It will be the first time Warburton and many of his players have faced Celtic. "This game on Sunday is important, but our job between now and 6 August is to work hard to try to close that gap," said Warburton. "A gap clearly exists. It would be foolish to say otherwise. "They're top of the Premiership, they're champions, the European campaigns they've had of late and the financial impetus that's given them. "We won't close it completely, but what we have to do over the summer is recruit well, build the environment again, keep moving forward and hopefully close the gap." That is for another day though. More immediately, Warburton, whose side have won the Championship title and promotion, knows the supporters desperately want to buck their underdog tag on Sunday. "Any neutral would say Celtic have to be favourites," he said. "Of course they are. "But Rangers have been in good form this season. "We've had a good level of consistency, the quality's been evident, individually. "As a team, we've been strong and they deserve to be where they are. "So we know what we can do. We're well prepared, we go into the game wanting to win, expecting to put in a good performance and we'll see where that takes us." Warburton admits he and many of the players who have led the team to the Championship title are taking a step into the unknown, but he doesn't believe that's a drawback. "Davie Weir has played in many of these games," he said of his assistant. "So has Kenny Miller, so there is lots of experience in the camp. "But it's pointless saying I know what's coming. If you haven't played in the game, it would be foolhardy to say you know what will happen. "However, these guys are pro footballers. This is what they do. "If you are a bricklayer and get told to build a wall twice as big as normal, you get on with it and deal with it."